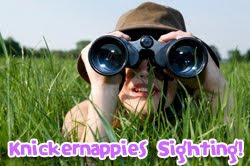 Knickernappies Sightings: Save on Knickernappies, Enter Giveaways & more! Shopping for cloth diapers? Don't forget to check out our Retailers for some great Sales and Discount Codes on Knickernappies products and much more! Cloth Baby Bums- Carries a great selection of Knickernappies and other diapering products and accessories. Save 15% for a limited time with code KND15. GoGoNatural- Weekly Special: Save 10% off your Knickernappies order with code KND10. *Also, don't forget to Follow @GoGoNatural on Twitter. On June 15th one lucky follower will win a Knickernappies Onesize Diaper! Top to Bottom Baby- Top to Bottom Baby is one of our newest retailers and we're super proud to have them on board. They've got a Knickernappies Feature up on their Blog and they're giving away a Knickernappies Onesize Diaper! Contest ends June 1th so make sure you enter today! Do you have a Knickernappies Sighting that we should add? Leave a message and we'll get it listed.